These essential DC restaurant dishes show off the incredible diversity of the District's dining scene. With DC emerging as one of the country's top dining destinations, we want to show off the signature dishes and flavors at some of the city’s most popular restaurants. Of course, it’s hard to go wrong at many of these eateries, but if you’re a “What’s the dish I should try?” type of diner, we’ve got you covered. A reminder: restaurant menus frequently change, so while these dishes are often featured, there’s no guarantee that they will be available on the night of your visit. Check with a server about the dish’s availability, or opt for another one of the restaurant’s tasty offerings. Himitsu means “secret” in Japanese, but this eatery in Petworth is far from that to foodies in the District. Chef Kevin Tien previously worked at the Michelin-approved Pineapple & Pearls, and he brings healthy helping of creativity to Himitsu, which blends Latin American and Southeast Asian cuisines to perfection. The must try is the chicken karaage, a fried chicken dish flavored with chili glaze, sweet pickles and mayo that will make you forget about KFC forever. A woodfire-powered kitchen, bucolic decor and an Italian-infused menu have turned The Red Hen into one of the city’s most popular neighborhood restaurants. Get a little adventurous when you order up the grilled beef short rib, which takes Italian flavor (specifically, parmigiano fonduta and balsamico) and spice (smoked onion salsa verde) to create an entirely innovative and delicious take on the dish. Guided by German-born chef Ralf Schlegel, Plume was awarded with a coveted Michelin star in DC’s first Michelin Guide. It’s easy to understand why when you try the restaurant’s rendition of lobster gratin, a classic seafood dish brought to vibrant life by Schlegel and his crew. Lobster meat is accompanied by lobster bisque and lobster chips, as well as root vegetable and Nantua sauce. We are ready to dig in. From the mind of Chef Robert Wiedmaier (winner of Chef of the Year at the 2009 RAMMYs), this fine dining establishment is a French experience through and through. The boudin blanc is a favorite, so much so that it’s written as “Marcel’s Classic Boudin Blanc” on the menu. The delicious white sausage is served with black truffle mushroom puree, caramelized onions and lardons of bacon. The Source’s wonton soup blends pork, chicken and beef over egg noodles, scallions, cilantro, shrimp and pork dumplings and a poached egg flavored with tea and soy sauce. The hearty soup is enough for two to indulge in. The stylish Maketto on H Street NE features one of the city’s hottest dishes. Chef Erik Bruner-Yang takes on fried chicken with flair, turning it into a crispy Taiwanese platter that is both sweet and spicy (thanks to the kick of peppercorns). Served on top of French bread, the ensemble can feed three people, who will most likely sit in silence as they marvel at the dish’s flavor explosion. Espita Mezcaleria serves Southern Mexican cuisine in the happening Shaw neighborhood, and, as you may be able to glean from its name, plenty of mezcal. Take the taste buds on quite the trip with the barbacoa de Borrego tacos, which consist of slow-roasted lamb, chipotle tomatillo salsa, onion and queso fresco. That flavor explosion goes hand in hand with a strong mezcal drink. Seasoned chef Cedric Maupillier, who honed his skills at Mintwood Place, has wowed the masses with his innovative rendition of French cuisine at Convivial. The standout is the fried chicken ‘coq au vin,’ which features double-fried chicken, mushrooms, potatoes and bacon, all smothered in a wine glaze. Dishes like this are why Convivial ended up on Washingtonian’s 2017 list of the city’s best restaurants. Former Top Chef contestant Mike Isabella transports diners to the Iberian Peninsula and North Africa with Arroz, located inside the Marriott Marquis Washington, DC. The Spanish word for rice, Arroz delights with bold flavors in bomba rice dishes, including one topped with aged duck confit, spicy fennel, burnt cucumber and red onion lebne. Tail Up Goat, located in the heart of Adams Morgan, has generated nothing but rave reviews since opening in 2016. Mediterranean flavor courses through the lamb ribs, which has become one of the most popular dishes at the eatery. The succulent meat is served with oregano, grilled lemon, fig, olive, fennel and onion yogurt, and is perfect for two to share (ingredients change seasonally). Take a trip to the French Quarter without leaving Penn Quarter when you visit Acadiana, known for its creative takes on New Orleans classics. The barbeque shrimp take down-home to a whole new level, with the head-on shrimp served with garlic butter, black pepper and Worcestershire sauce. We’re on our way there already. For pizza lovers, All-Purpose Pizzeria is a dream come true. The team behind The Red Hen and Boundary Stone brought their Italian-American cuisine expertise to this spot anchoring the Shaw dining scene, with distinctive pies sure to tinge your pizza passion. Try Better Days, which incorporates vine ripe tomatoes, squash blossoms, mozzarella and stracciatella cheeses and extra virgin olive oil. A visit to The Salt Line will transport you from the District to coastal New England, as Chef Kyle Bailey’s seafood-centric eatery incorporates flavors from the Eastern seaboard like few other restaurants in the area. The lobster roll is a favorite at the Capitol Riverfront locale, served on a split top bun and garnished to your liking (we prefer it dressed in butter). You can’t go wrong with the raw bar here, either. Chef Tim Ma has created a sensory masterpiece at Kyirisan, his Michelin Guide Bib Gourmand honoree in Shaw that melds French culinary techniques with Asian ingredients and flavors. 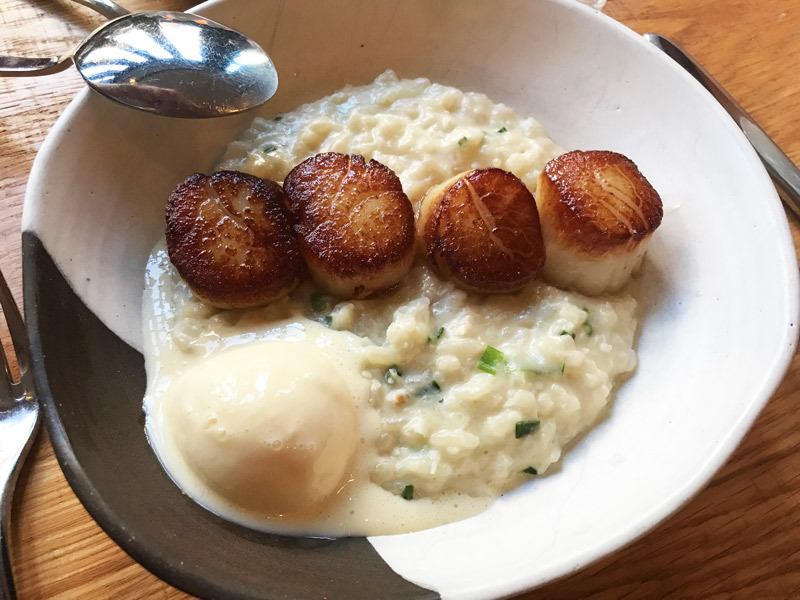 The pan-seared scallops are cooked to perfection and laid to rest on top of a creamy coconut risotto with basil ice cream and topped with scallions. Before tucking into the scallops, chef’s orders are to mix the ice cream into the risotto for the ideal texture, which yields a cool sweetness you won’t soon forget. Sure, you’ve had lamb chops before, but Rasika West End takes the dish to another level. The highly acclaimed Indian restaurant cooks the chops with a tandoor, a clay oven that uses wood and charcoal for maximum heat and flavor. Graced with mace and cardamom (two types of Indian spice) and garnished with cashew nuts and ginger, the dish is Indian-style cooking at its best. This teensy 24-seat restaurant in Columbia Heights has been the star of the DC culinary scene with its modern take on Filipino food, served family-style and only to groups of four or fewer. Diners have gravitated towards the ampalaya, a melon dish cooked with salt, then toasted with tomatoes, red onions, shallots and ginger. An egg and black beans top off this foreign special. Marjorie Meek-Bradley’s sandwich shop in Mount Vernon Square, Smoked and Stacked, has been a sensation since opening in 2016. One of its highlights is The Messy, a Reuben-like creation that will make other sandwiches quake in its path. Smoked pastrami is adorned on rye bread and accentuated by Comté cheese, Thousand Island dressing and sauerkraut. Divided into a ramen shop and an izakaya (a Japanese bar), Daikaya has become one of the most popular restaurants in the city. Get to the Chinatown ramen shop early (lines form for lunch every day) to try the shoyu ramen, which features Nishiyama noodles (rarely used in the U.S.), Chintan stock and a soup base that is prepared over 16 hours. The noodles and broth form a flavor combination you’re sure not to forget anytime soon. One of the city’s most spectacular culinary creatives for more than a decade, Eric Ziebold gets bold at the Michelin-starred Kinship with his spin on a classic French dish. The torchon mix consists of mushrooms, caramelized garlic and onions to go along with pureed butter. Served alongside a baby beet and wild mushroom salad, toasted brioche and huckleberry gastrique, this dish tastes as excellent as it sounds. Step into Federalist Pig in Adams Morgan and you will feel as if you’ve been granted access to someone’s private kitchen. The coziness gives way to some of the best barbecue in the city, and The Big Cheese is a crown jewel: melted cheese, crispy onions and barbecue sauce are lathered on top of your choice of chopped pork or brisket. Make sure to load up on sauces and sides (we love the smoked cheddar mac and cheese!). The neighborhood comfort of Compass Rose is reflected in its menu, sprinkled with international cuisine that can be served in a restaurant or on the street. 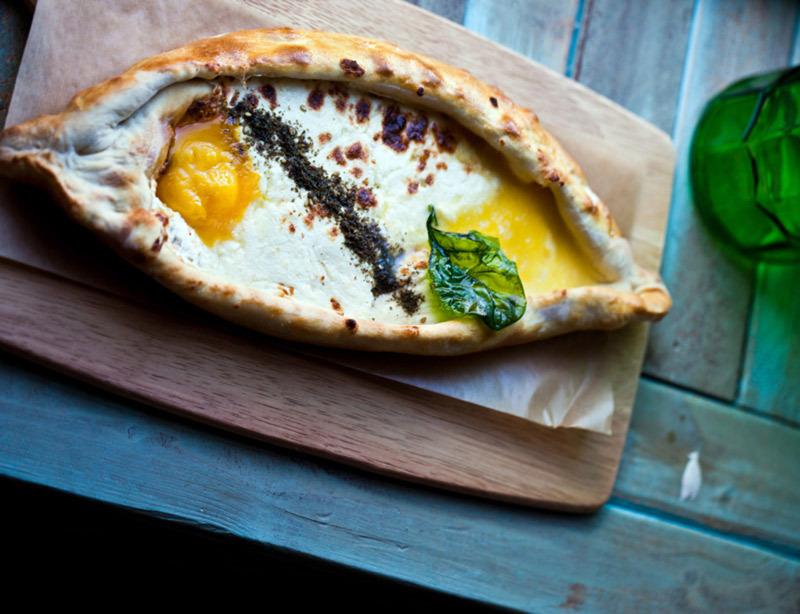 The star of the show at this hot spot located one block from U Street is the khachapuri, a cheese-filled bread coated in an organic egg and butter, often served in Georgia. Pair this with a Pass the Ish, a drink featuring Sarajishvili Georgian brandy and fresh lemon, and you’re officially transported. Although you will have to visit The Grill Room in Georgetown during lunch time to enjoy this American specialty, it’s well worth a break from the humdrum of the office. 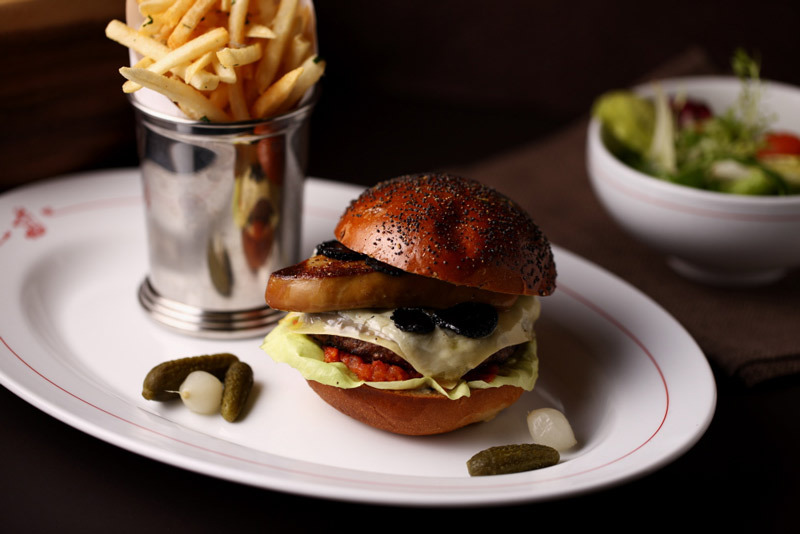 Served on a sesame seed bun with house-made mayo and truffle cheese, the juicy cut of deliciousness may have you journeying to The Grill Room for lunch on the reg. Mike Isabella has appeared on Top Chef, and is the brilliant culinary mind behind DC restaurants like Kapnos and Arroz. The chef can also craft one heck of a sandwich, as evidenced by the wonders at G by Mike Isabella. 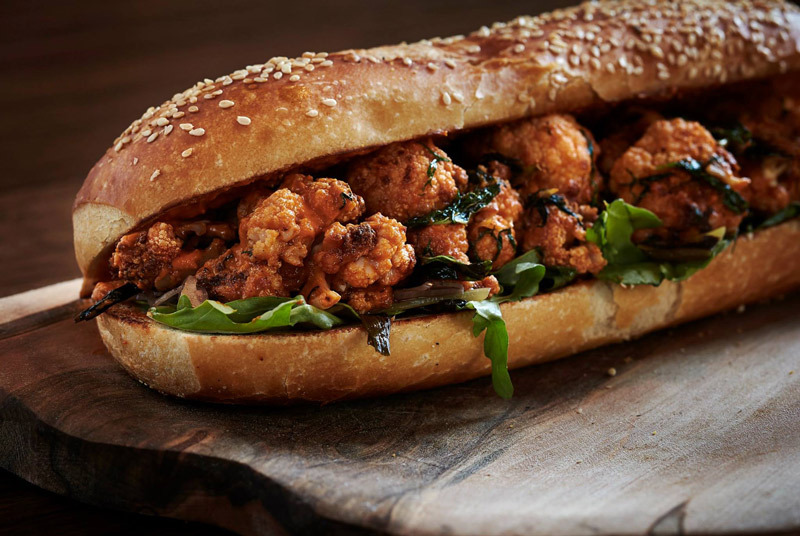 The roasted cauliflower sandwich is a favorite among loyalists, a vegetarian option with enough flavor to satisfy all taste buds. Still hungry? Check out these hot restaurants to try now as you wine and dine your way through the District.